The only truly important qualification in realism is the attempt to reach perfection. 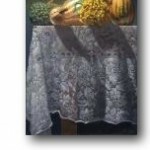 Traditional art includes rendering, color perspective and the classic application of oil paint. 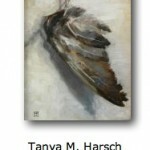 Oil Painters of America, Eastern Regional was recently exhibited at Eisele Gallery of Fine Art in Fairfax, showcasing fine traditional art. These kinds of paintings are handed down as timelessly treasured heirlooms in a glowing, historically archival medium, which may have led to the sale of nearly three dozen works in the show. Juried by Austrian plein air painter Carolyn Lewis, the exacting art of traditional painting shown here this autumn was a fine example of the quality now being employed by contemporary oil painters. 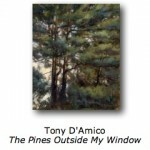 Through the paces of ornate still life, like that of Hans P.Guerin’s parade of textures depicted in gourds resting atop a nearly unbelievable rendered draped lace tablecloth, portraits offering many standouts like “Night Out” by Kathie Wheeler, and landscapes, well-represented by Tony D’Amico’s bird’s eye view through “The Pines Outside My Window”, the value of dedication becomes obvious. In traditional art, sentiment and nostalgia are acceptable. Paintings of children, help spark our memories, and a sense of nostalgia—a longing for things past—is quietly evident in several sailing scenes. One feels the artists’ personal association with the sea and the boats. Prize winners were not necessarily pieces which struck my individual tastes, and I’d like to mention a few that I found a cut above. When an artist is chosen to be accepted with contemporary artists of this caliber, their value is assured by just being hung. 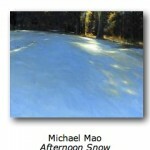 In “Afternoon Snow”, Michael Mao instilled the cold solitude of an expanse of snow in shadow nearly filling the picture plane, with late day sunshine creeping through the upper portion to splash a pattern on the chill surface. Jeff Morrow’s portrait of “Allan” is chosen mostly because the subject is a model I use frequently myself. 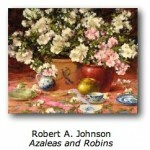 The simplicity of Tanya M. Harsch’s brushy, grey bird wings, “Treasure”, and the opulent abundance of petals and teacups in Robert A. Johnson’s “Azaleas and Robins”, illustrate the values of quiet monochromatics and/or colorful chaos. 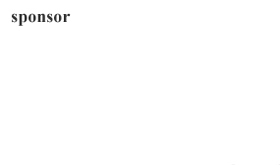 Organizations like the OPA are invaluable outlets for artists. It’s worthwhile to take in any of these juried exhibits because they offer the best examples of their mediums to the public view. Founded in 1991 by Shirl Smithson , OPA focuses primarily on the lasting value of fine drawing, color, composition and the appreciation of light, a veritable renaissance of painterly qualities which deserve to be preserved. Eisele Gallery continues its devotion to assembling “the finest display of representational paintings” with an elegance that the subject deserves. The next exhibit, continuing this mission, showcases the works of Frank and Dianne McElwain, popular Cincinnati artists Nov. 7 through Dec. 6. Make it a point to attend an opening at Eisele. They are celebrations of more than just art. Doug Eisele garnishes the nibble tray with delicious home-made meatballs adding to the palette.